It was the perfect test for the new J/108: we were in Key West, and the light southerly breeze was opposing an ebb tide, creating a nasty chop in the shipping channel, so we opted instead to make an end run through the thin water between Sunset Key and Wisteria Island. It was the perfect test for the new J/108: we were in Key West, and the light southerly breeze was opposing an ebb tide, creating a nasty chop in the shipping channel, so we opted instead to make an end run through the thin water between Sunset Key and Wisteria Island. Scooting through in a typical deep-draft J/Boat would have been risky, at best. But the J/108 is no typical J. 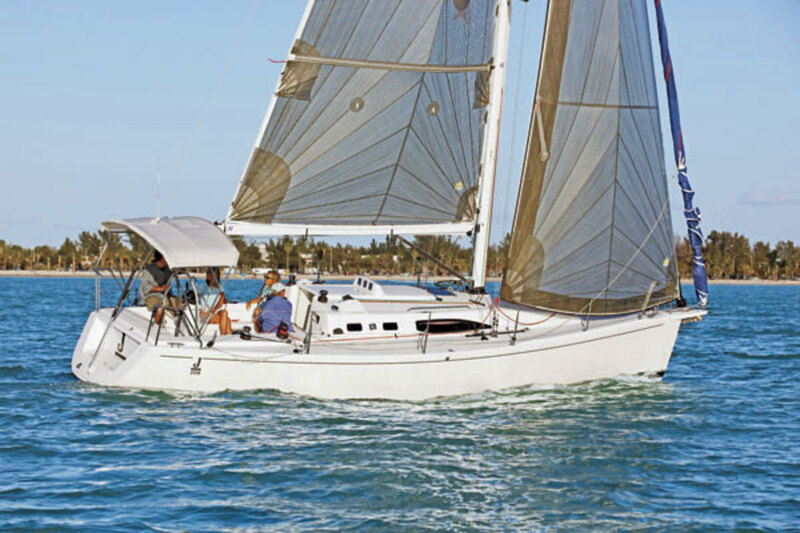 Like the 31-foot J/95, which came out in 2009, it has a shoal-draft keel/centerboard and twin rudders. It shares the hull of the acclaimed J/109, which draws 7 feet. But with the centerboard up, the J/108 draws just under 4 feet—about the same as a J/24. Sure enough, as we motored out of the dredged channel toward the anchorage in the lee of Wisteria Island, the depth sounder plunged to 14, 10 and then 7 feet. Aboard a J/109 we would have been biting our fingernails. Aboard the J/108, it was a piece of cake. Under sail, the J/108 proved equally impressive. Although the light breeze never topped 10 knots, the boat proved nimble on the wind and tacked easily and without hesitation—even when we wandered into the light chop on the edge of the aforementioned shipping channel. As a testament to the boat’s ability, I completely forgot about lowering the centerboard until near the end of the sail. Doing so, via a pair of control lines on the cabintop, was effortless. As is the case with the J/95, the twin rudders provide fingertip control. The helm is so responsive you have to mentally readjust to avoid over-steering. Under power, you have complete low-speed control, both in forward and reverse. Though the J/108 shares the J/109’s hull, it is a very different boat. 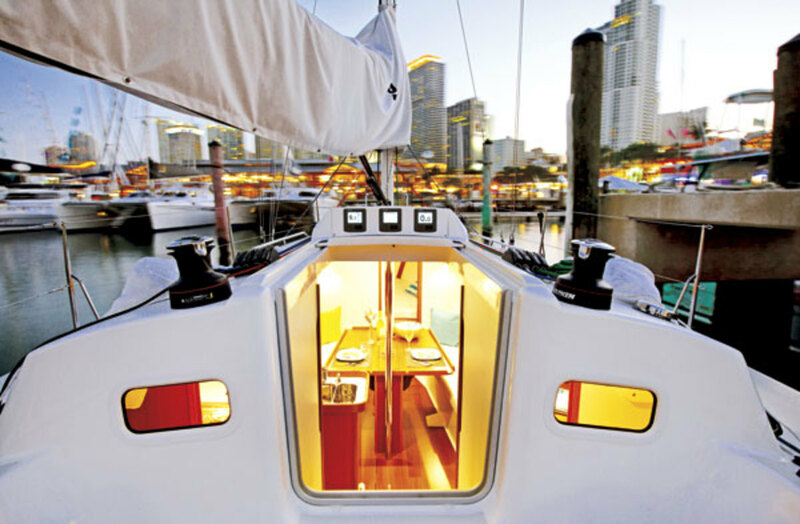 Aside from the different underwater appendages, the 108 features an open transom with a removable dock box, a restyled cabintop, a German mainsheet arrangement, a shorter rig and 500 more pounds of ballast to counteract the effects of shoal draft on righting moment. There is also a fixed bowsprit with a dedicated anchor roller and tack point for a reaching sail. Belowdecks, the J/108 has the same practical arrangement common to many J/Boats: conventional settees in the saloon, a head and shower to starboard of the companionway and a refreshingly large nav station. One of the nice things about the permanent bowsprit is that, unlike a retractable sprit, it doesn’t intrude on the V-berth in the bow. The 30hp diesel was more than up to the task of keeping the boat on the go as the wind died off toward the end of our sail. (At 2,000 rpm we did nearly 7 knots.) 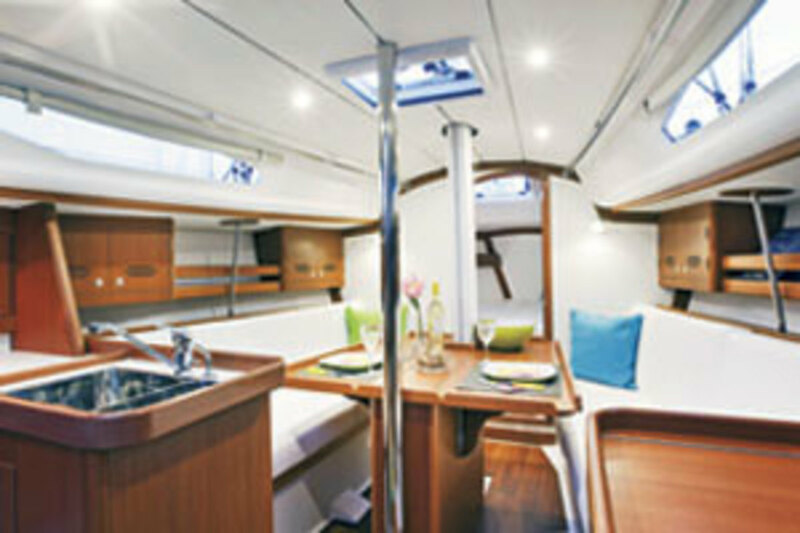 The main traveler is located on the cockpit sole immediately forward of the helm, right where it belongs if you care about mainsail trim, while the J/108’s wide side decks and well-designed cockpit are vintage J/Boats.